38 Idols are quite specific. But your will is universal, being limitless. And so it has no form nor is content for its expression in the terms of form. Idols are limits. They are the belief that there are forms which will bring happiness and that, by limiting, is all attained. It is as if you said, "I have no need of everything. This little thing I want, and it will be as everything to me." And this must fail to satisfy because it is your will that everything be yours. Decide for idols, and you ask for loss. Decide for truth, and everything is yours. 39 It is not form you seek. What form can be a substitute for God the Father's love? What form can take the place of all the love in the divinity of God the Son? What idol can make two of what is one? And can the limitless be limited? You do not want an idol. It is not your will to have one. It will not bestow on you the gift you seek. When you decide upon the form of what you want, you lose the understanding of its purpose. So you see your will within the idol, thus reducing it to a specific form. Yet this could never be your will because what shares in all creation cannot be content with small ideas and little things. 40 Behind the search for every idol lies the yearning for completion. Wholeness has no form because it is unlimited. To seek a special person or a thing to add to you to make yourself complete can only mean that you believe some form is missing. And by finding this, you will achieve completion in a form you like. This is the purpose of an idol—that you will not look beyond it to the source of the belief that you are incomplete. Only if you had sinned could this be so. For sin is the idea you are alone and separated off from what is whole. And thus it would be necessary for the search for wholeness to be made beyond the boundaries of limits on yourself. 41 It never is the idol that you want. But what you think it offers you, you want indeed and have the right to ask for. Nor could it be possible it be denied. Your will to be complete is but God's will, and this is given you by being His. God knows not form. He cannot answer you in terms which have no meaning. And your will could not be satisfied with empty forms made but to fill a gap which is not there. It is not this you want. Creation gives no separate person and no separate thing the power to complete the Son of God. What idol can be called upon to give the Son of God what he already has? 42 Completion is the function of God's Son. He has no need to seek for it at all. Beyond all idols stands his holy will to be but what he is. For more than whole is meaningless. If there were change in him, if he could be reduced to any form and limited to what is not in him, he would not be as God created him. What idol can he need to be himself? For can he give a part of him away? What is not whole cannot make whole. But what is really asked for cannot be denied. Your will is granted. Not in any form that would content you not, but in the whole completely lovely Thought God holds of you. 43 Nothing that God knows not exists. And what He knows exists forever, changelessly. For thoughts endure as long as does the mind that thought of them. And in the Mind of God there is no ending nor a time in which His Thoughts were absent or could suffer change. Thoughts are not born and cannot die. They share the attributes of their creator, nor have they a separate life apart from his. The thoughts you think are in your mind, as you are in the Mind Which thought of you. And so there are no separate parts in what exists within God's Mind. It is forever one, eternally united and at peace. 44 Thoughts seem to come and go. Yet all this means is that you are sometimes aware of them and sometimes not. An unremembered thought is born again to you when it returns to your awareness. Yet it did not die when you forgot it. It was always there, but you were unaware of it. The Thought God holds of you is perfectly unchanged by your forgetting. It will always be exactly as it was before the time when you forgot and will be just the same when you remember. And it is the same within the interval when you forgot. 45 The Thoughts of God are far beyond all change and shine forever. They await not birth. They wait for welcome and remembering. The Thought God holds of you is like a star, unchangeable in an eternal sky. So high in Heaven is it set that those outside of Heaven know not it is there. Yet still and white and lovely will it shine through all eternity. There was no time it was not there; no instant when its light grew dimmer or less perfect ever was. 46 Who knows the Father knows this light, for He is the eternal sky which holds it safe, forever lifted up, and anchored sure. Its perfect purity does not depend on whether it is seen on earth or not. The sky embraces it and softly holds it in its perfect place, which is as far from earth as earth from Heaven. It is not the distance nor the time which keeps this star invisible to earth. But those who seek for idols cannot know this star is there. 47 Beyond all idols is the Thought God holds of you. Completely unaffected by the turmoil and the terror of the world, the dreams of birth and death that here are dreamed, the myriad of forms that fear can take; quite undisturbed, the Thought God holds of you remains exactly as it always was. Surrounded by a stillness so complete no sound of battle comes remotely near, it rests in certainty and perfect peace. Here is your one reality kept safe, completely unaware of all the world that worships idols and that knows not God. In perfect sureness of its changelessness and of its rest in its eternal home, the Thought God holds of you has never left the Mind of its Creator Whom it knows, as its Creator knows that it is there. 48 Where could the Thought God holds of you exist but where you are? Is your reality a thing apart from you and in a world which your reality knows nothing of? Outside you there is no eternal sky, no changeless star, and no reality. The Mind of Heaven's Son in Heaven is, for there the Mind of Father and Son joined in creation which can have no end. You have not two realities, but one. Nor can you be aware of more than one. An idol or the Thought God holds of you is your reality. Forget not, then, that idols must keep hidden what you are, not from the Mind of God, but from your own. The star shines still; the sky has never changed. But you, the holy Son of God Himself, are unaware of your reality. 1 Christ's Second Coming gives the Son of God the gift to hear the Voice for God proclaim that what is false is false and what is true has never changed. And this the judgment is in which perception ends. At first you see a world which has accepted this as true, projected from a now corrected mind. And with this holy sight, perception gives a silent blessing and then disappears, its goal accomplished and its mission done. 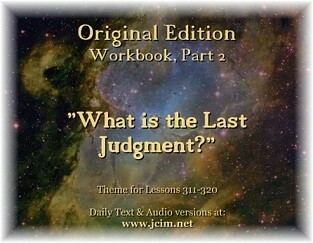 2 The final judgment on the world contains no condemnation. For it sees the world as totally forgiven, without sin and wholly purposeless. Without a cause and now without a function in Christ's sight, it merely slips away to nothingness. There it was born, and there it ends as well. And all the figures in the dream in which the world began go with it. Bodies now are useless and will therefore fade away because the Son of God is limitless. 3 You who believed that God's Last Judgment would condemn the world to hell along with you, accept this holy truth: God's Judgment is the gift of the correction He bestowed on all your errors, freeing you from them and all effects they ever seemed to have. To fear God's saving grace is but to fear complete release from suffering, return to peace, security and happiness, and union with your own Identity. 4 God's Final Judgment is as merciful as every step in His appointed plan to bless His Son and call him to return to the eternal peace He shares with him. Be not afraid of love. For it alone can heal all sorrow, wipe away all tears, and gently waken from his dream of pain the Son whom God acknowledges as His. Be not afraid of this. Salvation asks you give it welcome. And the world awaits your glad acceptance, which will set it free. 5 This is God's Final Judgment: "You are still My holy Son, forever innocent, forever loving and forever loved, as limitless as your Creator and completely changeless and forever pure. Therefore awaken and return to Me. I am your Father and you are My Son." 1 I have a special place to fill—a role for me alone. Salvation waits until I take this part as what I choose to do. Until I make this choice, I am the slave of time and human destiny. But when I willingly and gladly go the way my Father's plan appointed me to go, then will I recognize salvation is already here, already given all my brothers and already mine as well. 2 Father, Your way is what I choose today. Where it would lead me, do I choose to go; what it would have me do, I choose to do. Your way is certain and the end secure. The memory of You awaits me there, and all my sorrows end in Your embrace, which You have promised to Your Son, who thought mistakenly that he had wandered from the sure protection of Your loving arms. In this Lesson, Jesus reminds us, we "have a special place to fill; a role for me alone." (W.317.1.1) We may wonder what that special place is for us to fill? What am I appointed to do? What is the role I am to fill? In this Lesson, Jesus says that until we understand the answer to this question, "salvation waits." (W.317.1.2) Until we take our place in salvation, we are the "slave of time and human destiny." (W.317.1.3) What is it that we are being asked to do? As I see it, we only have one requirement and it is to forgive. It is the one role we undertake in relation to those in our lives who are there, playing their roles perfectly for our healing. Our function is to forgive these special relationships so we can come to know our own holiness. We have a choice in how we use time, but if we don ' t use it for the purpose of forgiveness, we will not lose the opportunity presented to us. Salvation simply waits on our readiness. Forgiveness is the means to salvation. When we make the decision to take this path of undoing our misperceptions through forgiveness, time is being used for its intended purpose, which is to remember who we are. To do that, I must "willingly and gladly go the way my Father's plan appointed me to go." (W.317.1.4) That sounds to me like God has a plan for us. Yet if we are already safe at home with Him and dreaming of exile in this world, there can be no plan except for us to "recognize salvation is already here, already given all my brothers and already mine as well." (W.317.1.4) Until we make this choice, we are the "slave of time and human destiny." (W.317.1.3) We are stuck in the ego's cycle of birth and death. Accepting Atonement for ourselves is simply the acceptance of the truth of who we are as eternal beings of light and love, and the way to this acceptance is through forgiveness. We have a choice as to whether to follow the ego's plan or the Holy Spirit's plan. It is our decision as to which voice we listen to. Today, we can choose to commit to follow the Holy Spirit and to allow Him to lead us. "Father, Your way is what I choose today." (W.317.2.1) As we join our will with His, we find our way back to the home we never left. Sometimes the motivation is very strong in us, and at other times, we may seem to be in the grips of the ego. There is a part of the mind that will do anything and everything to delay. It argues, debates, disagrees, judges, interprets, distracts, analyzes, and tries to control. When we listen to the wrong mind, we believe that we need to figure everything out on our own. We believe that we can find our own answers for our lives. We even put ourselves in charge of our own spiritual awakening. We believe we can fix ourselves and make ourselves loving and holy. We are willing to pay the price in suffering by pursuing our own goals. It is how we put off our awakening until some future time. To surrender feels hard, for it seems to be an affront to our independence. To recognize that we don't know and to become dependent as little children seems highly unsafe. We think that if we don't take charge of our lives, things won't get looked after. We still don't trust our brothers or ourselves. "Specialness is a lack of trust in anyone except yourself. Faith is invested in yourself alone." (T.24.IV.1.1-2) (ACIM OE T.24.V.34) Yet as we become willing to look at every thought, all beliefs we hold, all our concepts and values that keep us attached to this world of bodies, and acknowledge that we don't know the meaning of anything, we become willing to release what no longer serves us. Nothing of what we hold as true will bring the happiness we seek. Only by releasing all fear thoughts that keep us attached to the ego do we become free of its hold over us. Jesus tells us that at the root of every sorrow is the feeling of separation from God that we experience. "I need but turn to Him, and every sorrow melts away, as I accept His boundless Love for me." (W.207.1.3) He assures us, in this Lesson, that we were mistaken when we thought we had wandered from the protection of His Loving Arms. It is not possible for us to stray. We are not lost. When we awaken, we will realize that we just had a dream of exile while safe at Home. We need not spend our time exploring this dream. Our job is not to try to figure out our role in the dream, but it is to simply release it. The only value of looking at the darkness is to let it go. Our stories are basically all the same. The situations and characters are different, but the ego conspiracies are identical. They are the ego's devices for keeping us separate from the love that we are. As long as we believe the thoughts that accompany these conspiracies, we keep ourselves in enslavement to the ego. They involve thoughts related to issues of abandonment, betrayal, shame, abuse, inadequacy, unworthiness, lack, loss, rebellion, revenge, sacrifice, self-attack, failure, competition, comparison, and jealousy. We play out these beliefs in roles of victim-perpetrator or helper-rescuer. We each have a favorite strategy for playing out what we believe about ourselves. All these beliefs, and the roles we have taken on, have their roots in the belief that we have separated from Oneness and thus are guilty and expect to be punished for what we have done. We think we can escape responsibility for the separation by taking on the role of victim. Jesus offers us just one solution to the guilt and to the belief that we deserve punishment. That solution is to "willingly and gladly go the way my Father's plan appointed me to go." (W.317.1.4) In other words, we let go of what no longer serves us. We let go of the pain that comes from believing that we are on our own. induce the birth but waited a day, and it was on the day she agreed to wait that the baby died. Why? The pain in her is immense. The ego voice tells her she should not have waited. And then it tells her that at her age she may never have another pregnancy in the future. She obsessively returns to the thoughts of what she should have done and how the doctor is to blame for delaying the delivery. She is in deep pain, wondering why this has happened. The voice of the ego crucifies us and keeps us in hell. It is the voice of guilt, telling us that we are paying for past sins, and the future now seems painful too. How do we understand this? How willingly and how happily do we accept the script of our lives and recognize it all as a classroom for forgiveness and for awakening? When we see it this way, we become happy learners. Thus, no matter what shows up in our script, we accept that it is all for our awakening. How can we judge what anything in our lives is for? Did this baby make a choice not to come onto the planet at this time? We can't know all the reasons. Jesus tells us, "There is Someone with you Whose judgment is perfect." (Manual for Teachers.10.4.7) We can't know all the facts, but He does. He knows the past, present, and yet to come. He knows all the effects of His judgment on everyone and everything involved in any way. "And He is wholly fair to everyone, for there is no distortion in His perception." (M.10.4.10) That is something we can never do. That is why we must come to accept that we know nothing of how things should be. Our healing depends on investigating the upset and admitting that a healed mind would not be distressed. Since we experience distress, we now have an opportunity to look at what is underneath the pain. When it is too emotionally challenging, we can just rest with it, accept it, and trust that the answer is there when we are ready to accept it. Awakening seems to be a process where there is something here for us to do while we believe our experience here is real. We are called to do the forgiveness work in the special circumstances that show up for us that are actually perfect for our healing. The ego is restless and wants things to be different than they are. It is forever making plans and trying to control every situation. Yet when we learn to step back and follow in the way appointed us, we can rest in God and simply accept what is given us to do in this process of purification. Whatever the circumstance seems to be, we can use it for undoing the concepts, beliefs, and thoughts that keep our true reality hidden from our awareness. My function is my happiness and my function is forgiveness of all the interpretations and beliefs I hold in my mind. My function is to expose and undo the ego. That is the only purpose for time, and we can make that choice now. So much of our time is spent living in the past, looking at all the things we should have done, should have said, shouldn't have done, or shouldn't have said. We justify our guilt when all we need to do is choose the miracle instead by letting go of the past and realize that there is nothing to correct but our mistaken thoughts.